First of all create a database & create a table with the name ‘users’. Now as we’ve created our database it’s time for some coding. First we need to get our database in php coding. Create a file named db_config and put the below code in there. As we can see in the above code we’ve created a class called db_con & in there we’ve defined our db name, user & password. I’ve quoted every single line with commenting that which line doing what & which function is using for what. As we can see first of all we’ve included the db connection so that we can have the connection while calling the db connection through a object in constructor. For the registration process we are first encrypting the password with “md5 hashing” & then searching that if there is any username there in the db already by querying it & if the row is empty then we’re heading to insert the data in database. For the login process we’re searching for the username & password given by the user & then if it returns true than we’re giving a flag with $_SESSION[‘login’] = true so that when anyone tries to visit the other pages without login we can use this flag stop them. Then there is a function to get the fullname of the user & after that we’re starting the session & checking that if the user is logged in or not by the get_session() function. Now put the html work just after the php content you’ve putted in the file. In this form we’re having some validation for the form. Now above the code we’ve included the user class file so that we can have access to that user class. We’ve created a object for the user class & checking that if the submit button pressed than calling the check_login() function to log the user. Then go & post the code below right after your php code. Same as we do in login page we’re passing the form to php by post method it’s capturing them & then passing the values of the form into reg_user() function as parameter. Now to show our user just use html code below after your php code. Here we’re first checking that if the user is logged in or not if yes then we’re showing the user full name. For the logout button I don’t know but for the procedural php user it’s kind of new maybe we’re using a link like this “<a href=”home.php?q=logout”>LOGOUT</a>” and above the code in php tag we’re getting the “q” variable with $_GET function & running the function user_logout() to logout. You can download the source code frome here by simply clicking on the button. You can Fork me on Github also for the updated version of this one. I don’t know this is my first tutorial in php maybe not clear as i know. But if you understand this tuts a little than please leave a comment if you want anything else or what am i mistaking in here. An enthusiastic of work with over 2+ years of experience. Extensively experienced on wordpress, Codeigniter, Laravel. If you want to hire me then you can contact me via email or skype. What about e-mail verification ? 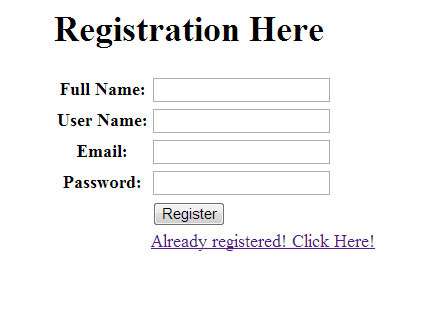 @bonaca: actually this is an easiest login & registration method. this is only for the beginners who wants to start with oop php so that’s why i just didn’t pack the email varification at this code sorry for that!! Amazing! Its truly amazing article, I have got much clear idea on the topic of from this article. I am really inspired together with your writing abilities as neatly as with the format in your weblog. Is that this a paid topic or did you modify it yourself? Anyway keep up the excellent quality writing, it is uncommon to see a nice weblog like this one nowadays..
plz say. i am new in php. Somebody essentially help to make critically articles I might state. That is the first time I frequented your website page and thus far? I amazed with the research you made to create this actual put up extraordinary. Wonderful activity! this is the part i don’t get it , can u explain it to me ? yes ofcourse i can explain. while fetching data of the user i’m counting if there’s any other user in that name is stored in my db or not. if yes means 1 row is there in that name than it’ll store that login user name in a session variable & if not than it’ll create an error message, that’s it !! hai..your post oops concept is nice for me..if u dont mind can u please give me ur gmail id? ?i want talk 2 u on something else?? I am getting error as check_login() function at line 16 is not defined. I don’t know what to do . Please help ! you can’t do that. without submitting form how can you insert something. is there any logic? what you can do is may be can do with jquery on hover or click effect by which you can run an ajax request than by that request you can insert something into db. otherwise it’s not possible. there must be a click or hover or some event needs to take place. try study jquery with ajax request. may be it can help you. You can insert data without form submitting into db , which is called static data. thanks for ur reply…. i need a code for registration for the testing purpose. what you need to do is just insert some data using php into mysqli. this code will help you to insert your desired data.. I think your insert query is not right. “SET ” is for UPDATE query right? I think there’s an object error. According to your first error there seems to be syntax error. Please debug with print_r or var_dump the whole array of objects. Then you might be able to sought out the errors. with this type of code $arr->a; You should get such arrays with this manner $arr[‘a’]. I think this is the solution. Debug first then you’ll get the answer. “true” & “false” is the boolean part. If you get true it means the user entered the corrent information into the database & if you get false that means the user entered the wrong information. Please w3programmers, I need help to become a good oop php programmer can u guys help me ? I’m a young and new programmer. hello, i want create db with “PosgreeSql”.. how that code working. Man, you are a gem! Cool, though no email validation. thank you for the share your code bro..can i ask if do you have login for admin to? thank you for the share your code bro..can i ask if do you have login for admin? can you share to me bro. sir..nice code.thanks a lot. bt how can i add namespace to it? In class.user.php, What does this line do “$_SESSION[‘uid’] = $user_data[‘uid’];” ? First time. I am going to share view with you Mr Code provider. Really Your code is good for fresher developer of php. R K Singh : 9818597149 New delhi (INDIA). Please try to make the same tutorial by using MySQLi procedural, i’d like to read from you this tutorial. Warning: myswli_fetch_array() expects parameter 1 Tobe mysqli_result,Boolean given in line no 43. Notice:trying to get property of non object in class.user.php on line 44. Sir, thanks . Sir How to add profile pic .??? Please add sir . As Salam O Alaikum Thank you so much! But, I checked my code my I followed all tings, which you mentioned in your post. 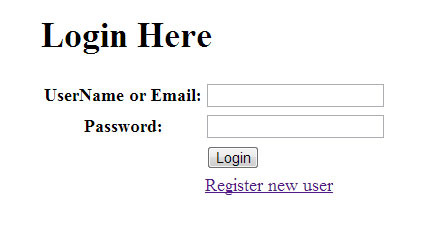 this was what I was looking for… how to call a login from a class! thanks a lot, buddy!